Unless otherwise noted, all designs are original and © Naturel Mistik, 1986-2018. Take me back to Naturel Mistik! Featuring my original themed pillowcases, The Toothcase and Sleeping Visions. I also make 100% linen pillowcases and all kinds of 100% cotton pillowcases. 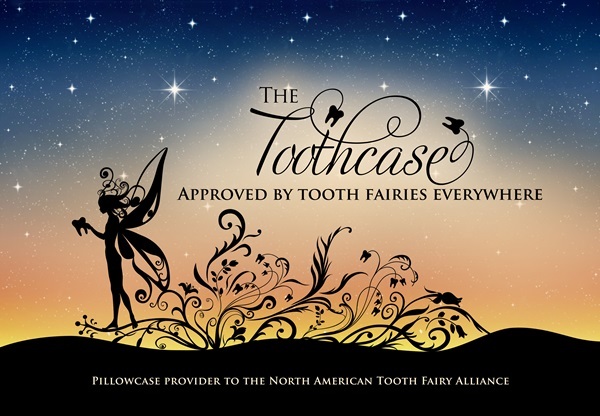 I am proud to have been designated an official pillowcase provider to the North American Tooth Fairy Alliance. My tooth fairy pillowcase design went through rigorous testing and was accepted by the NATF in 2012. I have been told the fairies really appreciate the ease of collection these pillowcases offer. Each Toothcase comes with an official Tooth Fairy Assistant Certificate and 3 Compensation Cards. The Toothcase and refill cards can be purchased in my pillowslips Etsy shop. Take a photo of your child sleeping on The Toothcase. Upload to one of these sites and add the image of a tooth fairy! Have you ever placed a crystal or tarot card under your pillow at bedtime, only to discover it on the floor in the morning? If so, then Sleeping Visions is the pillowcase for your dreams! Tuck your crystal, tarot card, aromatherapy sachet and more into one of the three pockets. Rest easy knowing your items will stay put during the night. Each pillowcase is made with 100% cotton fabric and is machine wash and dry - remember to remove your items first! The Sleeping Visions pillowcases can be purchased in my pillowslips Etsy shop.